I went looking for news about the marathon. I was hoping to include an interesting factoid or two into my review post. I wasn't completely out of luck. The first article I found told of how they gave the winning trophy to the wrong person. It sounds a bit difficult to not know who finished first - especially since this wasn't a photo-finish tie situation. But in the volunteer's defense, the marathon and the half marathon looped back together before the end. Even I, arriving much later, still had to weave between clumps of walking half-marathoners. So the winner, Matthew Palilla from Bend Oregon, was thought to be just another halfer. I mean, we had different bibs. But oh well. Matt was asked about the trophy. And I could relate to his need to get out of town. In my reading I found out that the Portland Marathon is run by volunteers. I also found out that it almost didn't happen this year as late as last Tuesday. The city didn't believe they had a good enough emergency plan. Fortunately for all of us, they found a compromise. But the most interesting news I found was questions about the length of the marathon itself. All marathons are 26.2 miles in length. Or they are supposed to be. That is why it makes no sense to ask how long this marathon is, or that marathon is. I've fielded those questions. And I try to make the correction. But maybe now I won't. We may have run a bit more than 26.2 miles on Sunday. Or at least those of us that started a bit later in the race. We may have run the non-classic 26.69 mile marathon. I don't think the marathon is going to come out and say anything, but it seems to be real. Many people noticed. And a few had GPS watches to map out their extra route. Using google map's street view I remember being at one of the intersections that was off-course. This could explain why my 5k split was so slow. I was running with J. at that point. The first mile marker we saw was mile 2. We couldn't believe we had been running almost an 11 minute per mile pace. We thought the mile marker was misplaced. We then lost heart seeing the 5k marker. I told J we were in trouble. Adding the extra milage brings the pace of my first 5k within range (9:28). 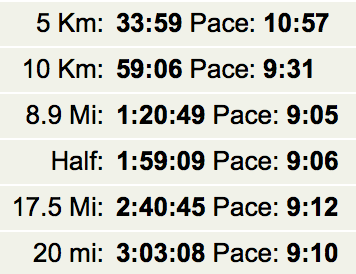 Of course, that still doesn't explain why the next 5k was so slow, or any of the other splits. But those are on me. I looked at the math. 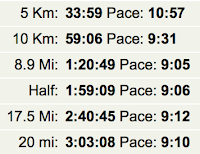 If you add the distance, my overall pace drops from 9:14 to 9:03. And if you run a marathon at that pace you would finish comfortably under four hours (3:57). I wonder if that would have happened. I wonder if the marathon will acknowledge the error. But with Matthew Palilla, I won't hold my breath. Pictures and fun stuff to come!